Our residential care home is located in O'Fallon, Missouri, part of the greater St. Louis metropolitan area. Caregivers Inn sits in the heart of a residential community on an expansive six acres of property that boasts an outdoor walking path and Gazebo. There are a number of services and amenities close to our home, as well as medical facilities located nearby. 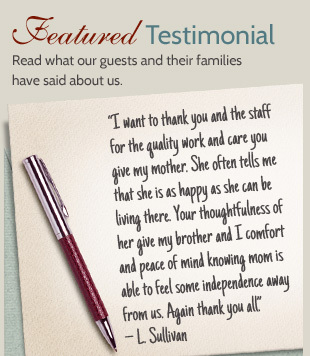 Our location is an integral part of what makes Caregivers Inn truly feel like home. From St. Charles: Take Interstate 70 West to South (left) on Bryan Road (Exit 216). Turn west (right) on Feise Road. Caregivers Inn is 1/4 mile up on the right-hand side. From Chesterfield: Take Interstate 40 West to North (right) on Winghaven Blvd. Turn west (left) on Feise Road. Caregivers Inn is 1/4 mile up on the right-hand side.